This year for Christmas, JC got a Chia pet. 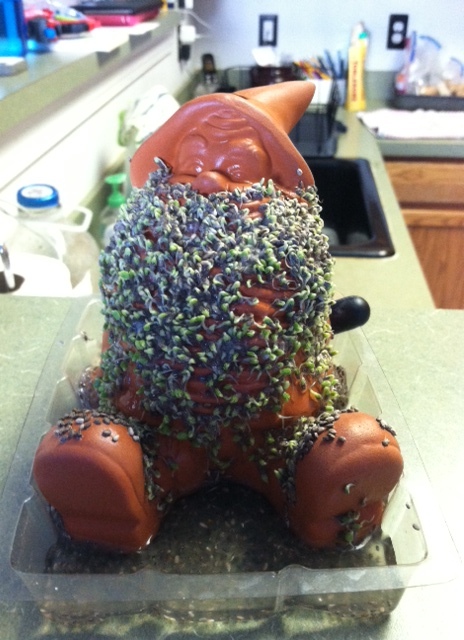 Technically, it’s a “Chia Gnome,” but I like to call it a Chia Hobbit. 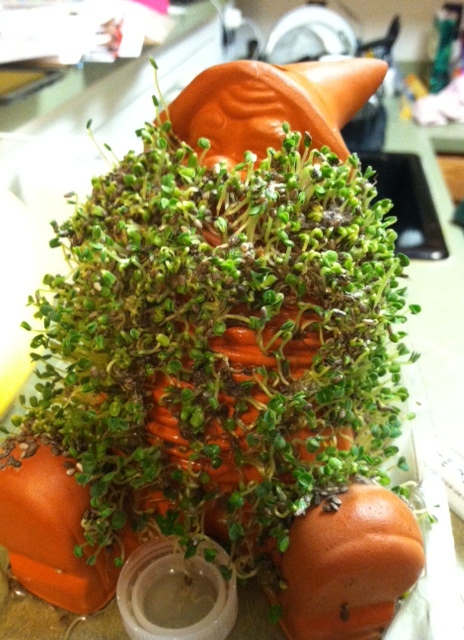 Unlike Eugene the Elf, Chia Hobbit is not creepy and does not freak me out. He’s a happy Hobbit who sits pleasantly in our kitchen, spreading luck and joy. My husband is especially fond of Chia Hobbit. In fact, he takes great care of the cute little bugger. Every day he makes sure Chia Hobbit is sufficiently hydrated (he has a hole in his hat so you can fill his fat jolly body with water), and even tends to Chia Hobbit’s growing beard with an eyedropper. Whenever he walks by Chia Hobbit, he checks the hole in the little guy’s head and makes sure he’s full, then lovingly squirts water on his beard. 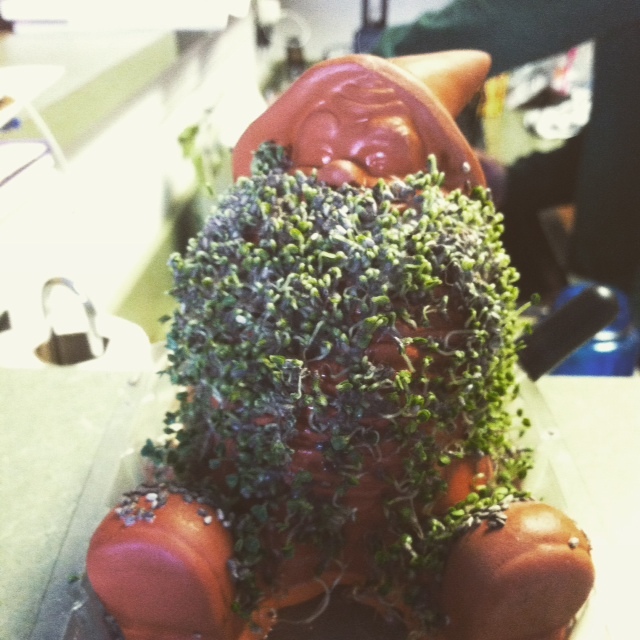 Well, there you go– a Chia Hobbit’s Journey, There and Back Again. 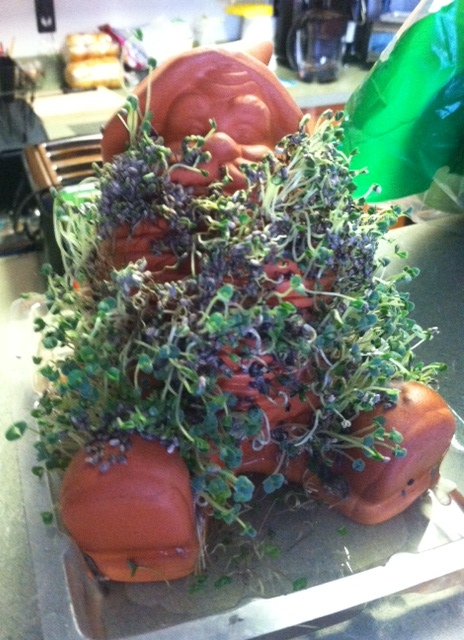 Admittedly, Chia Hobbit is getting a bit scroungy looking. He’s starting to look like a Hobbit hiding behind a bush. The box says that after two weeks, you should give up and reseed, and it’s been about two weeks now. We just don’t have the heart to destroy his lovely growth. Mr. Miyagi and Daniel-san with the Bonsai tree. That’s it. It’s always exciting over here at WOAW, right? 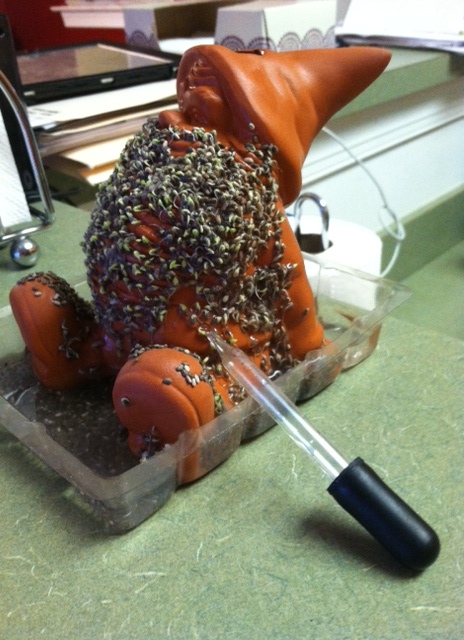 Have any of you experienced the fun of a Chia pet? If not, I suggest you pick one up and enjoy! LOL, too cute! I love watching people who get such a kick out of their gifts! It is kind of cute. Such a simple gift brings so much joy! I can’t begin to tell you how much I LOVED this. I was truly laughing out loud (LOL!) and NOT smiling a little (SAL). I am sooo happy you are back to blogging, and your new format is wonderful. Thanks Sweet Meg! I’ll visit TUW soon! Interesting placement of the water dropper…Im sitting with the husband and can’t help but comment.